Emily Elizabeth Dickinson (December 10, 1830 – May 15, 1886) was an American poet. 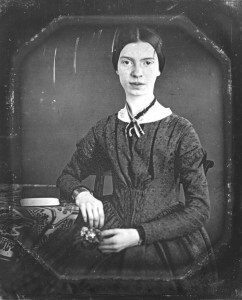 Though virtually unknown in her lifetime, Dickinson has come to be regarded as one of the great American poets of the 19th century. She wrote over 1700 poems, only a handful of them were published during her lifetime. Living a life of simplicity and seclusion, she yet wrote poetry of great power, questioning the nature of immortality and death, with at times an almost mantric quality. Within short, compact phrases she expresses far-reaching ideas; amidst paradox and uncertainty her poetry has an undeniable capacity to move and provoke.